In his booklet foreword, Hervé Niquet explains that it was quite normal at the courts of Louis XIV and XV to cobble together an evening’s entertainment by assembling excerpts from various different composers works to tell a story, thereby creating a sort of recital of pieces especially chosen in order to produce a new work on a specific theme, hence an ‘Opera of Operas’. The same was true of ballets and dramas, but the emphasis was always on story-telling, to which end, the text of a favourite aria might have had to be tweaked to fit in with the narrative. He goes on to explain that to celebrate his thirtieth anniversary with Le Concert Spirituel, he sought to draw on those works with which they had become associated, along with unknown, and sometimes unpublished, works to produce such a spectacle. He took as a starting point his fondness for the 1960’s and 70’s American TV show Bewitched, a staple of his childhood, and tried to devise a similar scenario for this L’Opéra des opéras. The text for the opera is based upon the theme of the love triangle, so popular in opera of the day. A princess is secretly in love with the prince, who loves her in return; the problems arise with the witch queen who is also madly in love with the prince. The land where they reside is in danger from a marauding army and a seemingly invincible monster; the people of the kingdom rally around the prince and promise to stand with him in his fight. The army wins the day while the prince unknowingly defeats the monster with the help of the queen’s magic. On his return, there is a great celebration in which the prince and princess publicly announce their love, much to the queen’s ire. She threatens the young couple with a terrible revenge and leaves to brood on her anger. She uses her magic to call on demons to come and do her bidding and help her destroy the prince, for if she cannot have him, no one can. She calls up a great tempest which devastates the coast, sinking many ships and destroying the coastal buildings. While the princess, unknown to the prince and the queen, is taken to safety, the prince is caught up in the torrent and his lifeless body washes up on the shore. The queen sees his body and, overcome with remorse, drowns herself in the sea. The princess comes to the cliff overlooking the beach, sees the seemingly lifeless body of her beloved and laments her loss; the prince awakes and the couple are reunited. The last of the storm clouds are banished and the sun’s rays hail the victory of love. The composite opera here is the result of combining the work of no fewer than sixteen composers, providing a feast of styles presenting the development and different aspects of French baroque opera. This is done with style and panache by Benoît Dratwicki, the artistic director of the Centre de musique baroque de Versailles, to produce an evening of music based on Hervé Niquet’s original idea. Strangely, the whole thing works well – but not seamlessly, as there are excerpts that stand out from the others. For example, Rameau proves himself to be streets ahead of some of the composers presented here. However, even the music of those composers new to me - la Doué, Blamont, Stuck, Destouches and Gervais - proves interesting and well-placed in the overall production. The effect is quite unusual, yet still thrilling and surprisingly concise, and although there are highlights, the combination of the well-known and completely unknown is more than just a compilation or recital of extracts; there is a real sense of consistency here. 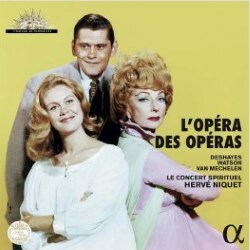 The three soloists sing superbly and really make this recording through their interplay and the colouring their voices. Katherine Watson is excellent as the princess, especially in her duets with the high tenor Reinoud van Mechelen; they portray a whole range of emotions and qualities in this relatively short work, from their love and bravery, to loss and back again to love and devotion, while Karine Deshayes’ depiction of the witch-queen’s unrequited love, anger, evil and despair is wonderful. However, the part played by the chorus of Le Concert Spirituel cannot be understated, and the orchestra in particular is on splendid form as it links the passages. If this entertainment is just the result of Hervé Niquet’s whim, then he should be allowed to explore his whimsical nature more often, as this production is one of great emotional diversity and beauty and captured in wonderful sound. The booklet notes are very good; they explain the original idea of the production and its historical context, and provide a synopsis in French, English and German, although the full text is given in French and English only. This is a production I would have loved to have seen live, and although it consists only of carefully selected excerpts, it represents one of the finest recordings of French baroque musical drama that I have heard in a long time.